School Re-Opens Thursday 30th August 2018. October Mid-Term Closed: Monday 29th October – Friday 2nd November, inclusive. Re-open: Monday 5th November 2018. Christmas Holidays Closed: Monday 24th December – Friday 4th Jan 2018, inclusive. February Mid Term Closed: Monday 18th February – Friday 22th February 2019, inclusive. Re-open: Monday 25th February 2019. St. Patricks Weekend Closed: Monday 18th & Tuesday 19th of March, 2019. Easter Holidays Closed: Monday 15th April – Friday 26th April, 2019, inclusive. Re-open: Monday 29th April, 2019. May Bank Holiday Closed: Monday 6th May. Re-open: Tuesday 7th May, 2019. June Bank Holiday Closed: Monday 3rd of June. Re-open: Tuesday 4th June 2019. 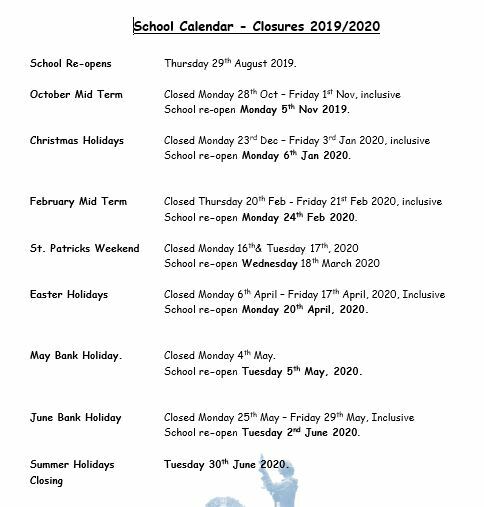 Summer Holidays Closing Friday 28th June 2019.